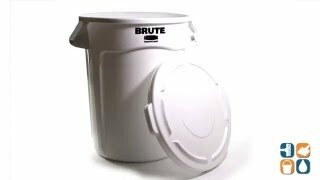 This flat-top, round Brute trash can lid from Rubbermaid is constructed from durable polyethylene and features a seamless design that is resistant to dents, rust and leaks, providing you with a high-quality solution for your waste disposal needs. This strong, snap-on round lid keeps your garbage in the trash can where it belongs. If you own Rubbermaid 32 gallon trash cans (sold separately, RCP 2632), these lids will also allow for secure, stable stacking to maximize space. This Rubbermaid’s white trash can lid is USDA Meat & Poultry Equipment Group Listed and complies with HACCP guidelines for food contact. Rubbermaid Commercial Products strives to provide customers with high quality, durable waste management solutions, becoming a popular choice with consumers. Dimensions: 22.4" Diameter. great quality. I adapted this product to project because I trusted its dimensions and material sturdiness.